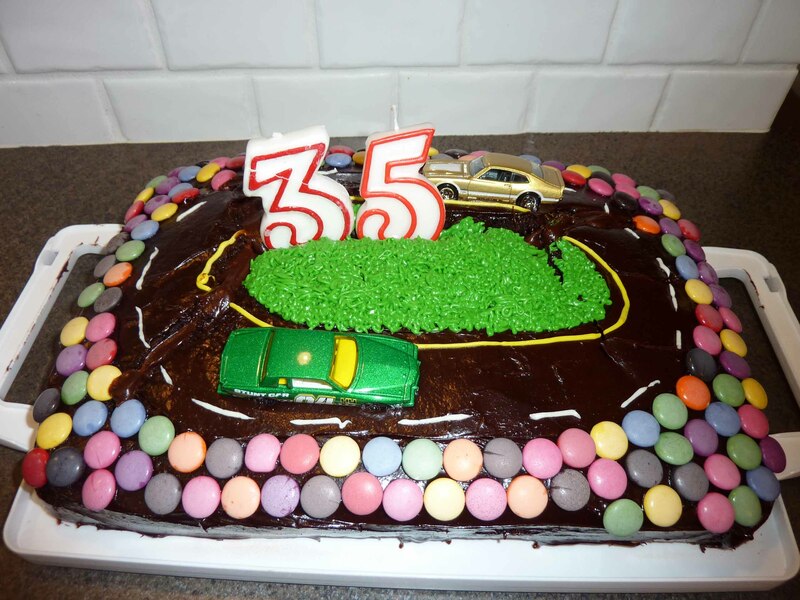 In past years, my husband’s birthday has been relatively low key (okay, unless you count the year he went on a helicopter ride), but besides that, it usually involves dinner, cake and gifts. This year, we have a four year old daughter who likes to throw birthday parties, even if it isn’t anyone’s birthday, so his birthday required a bit more oomph than usual. A big NASCAR fan, I thought a race themed party might be fun. Plus, with two girls this gave me the opportunity to throw a “boyish” birthday party. This birthday was low key compared to what I usually throw, but it was fun nonetheless and the kids had a great time! Although I’m not a fan, I have watched NASCAR before, and I knew the basic layout of the track including the yellow line and whatnot. I did a couple of things differently while decorating this cake because I didn’t have my usual “this-cake-needs-to-be-perfect-craziness” when I was decorating it. First thing was I decorated it while the cake was room temperature. I’m a big believer in decorating when the cake is frozen, but I didn’t have enough time to do that this go around. So, the cake ripped a bit, but nothing the icing couldn’t fix. The second thing was I put the cake outside to keep it cool as there wasn’t room in the fridge and the house temperature was warm and I didn’t want the icing to melt. I won’t be doing that again. The cake got extremely cold outside and then when I brought it in and set it on the counter overnight, I woke up and discovered that the cake had split in a bunch of places, looking like an earthquake hit the race track. I did some minor fixes, but wasn’t able to get it back to the way it looked originally. I was very laid back about this though as it was a cake for my husband. If this had happened on the morning of one of my girl’s birthday parties, it would have been a different story. 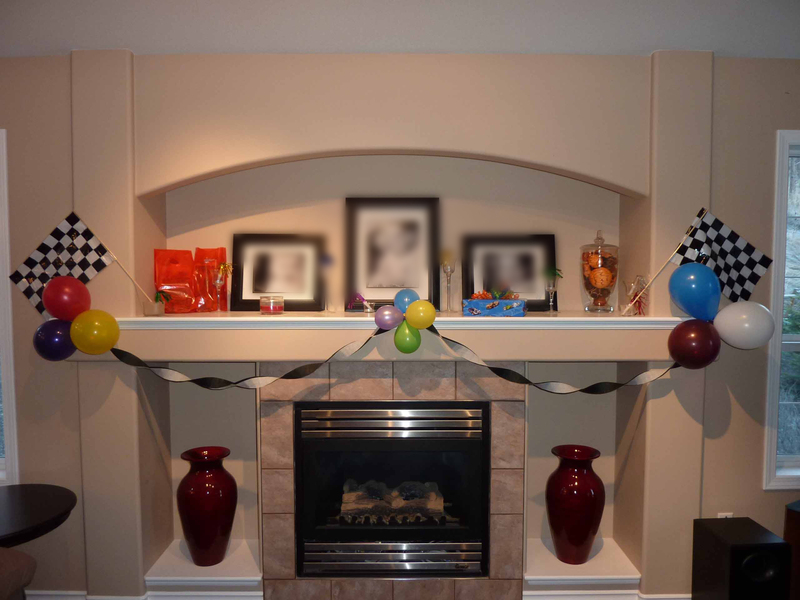 Having a fireplace is so much fun for special occasions! We’ve made good use of it for Christmas, Valentine’s and now birthdays. Pretty simple decorations, but it made a festive touch. I handed out loot bags for the kids. They included a Hot Wheels car, some Disney Cars stickers, Welch’s fruit snacks and cheese & bread sticks. The kids were happy with them. I had bought a 50 pack of red loot bags from Oriental Trading for $3.99. So far they have come in handy for Valentine’s day, this party’s loot bag and my youngest daughter’s upcoming birthday party. Good deal!